At a weaving centre perched on stilts over the waters of Inle Lake, I saw the painstaking work involved in making lotus thread, traditionally used for monks’ robes. This process is repeated countless thousands of times. A metre of fabric can require the stems of 6000 lotus flowers. This entry was posted in Burmese techniques and tagged Burma, handcraft, handwoven, Inle, lotus, Myanmar, traditional, weaving by Wendy Garrity. Bookmark the permalink. great technique! i did not know that fiber could be pulled from lotus plants. i’d like to try this technique with milkweed. 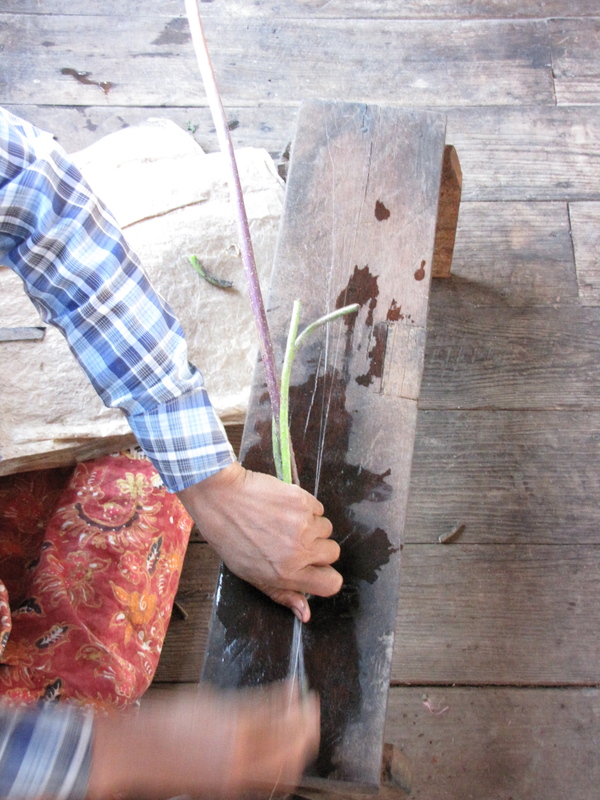 We saw this happening when we were at the weaving place on Inle Lake 4 years ago – it was amazing!